State of Mind Hearsay Exception - В сложной финансовой ситуации приходит на помощь кредит наличными в Казахстане. 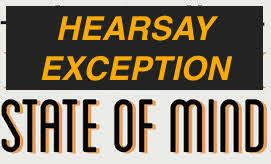 Sometimes hearsay statements are introduced at trial not to show the truth of the matter asserted by the out-of-court statement, but to prove a certain state of mind of the person that heard the out-of-court statement. In this situation, the out-of-court statement would be admissible and not considered hearsay. Prove the declarant’s state of mind, emotion, or physical sensation at that time or at any other time when such state is an issue in the action. Prove or explain acts of subsequent conduct of the declarant. For example, in a medical malpractice action, a CT Scan interpreted by a radiologist revealed an aortic tear (Type I dissection) that needed to be repaired. A test was conducted by a cardiologist to determine the extent and precise location of the tear and the patient died during or immediately after the test. The plaintiff (estate) argued that the test performed caused another tear and this tear caused the patient’s death. During trial, and over the objection of the plaintiff, the cardiologist testified that he was told by the radiologist (the declarant) that read the CT Scan of the aortic tear (Type I dissection). The plaintiff argued that this constituted hearsay since what the radiologist told the cardiologist was an out-of-court statement. The appellate court held that this did not constitute inadmissible hearsay because the out-of-court statement was not offered to prove the truth of the matter asserted, but simply to prove that the cardiologist had notice of the aortic tear (Type I dissection). See Dorsey v. Reddy, 931 So.2d 259 (Fla. 5th DCA 2006). In a civil action involving the termination of a county employee, the terminated employee sued a third party for intentionally interfering with the employee’s employment causing the county to terminate the employee. The third party wanted a report introduced at trial. The report was prepared by another county employee that depicted various wrongdoings of the terminated employee. The trial court ruled that this report constituted hearsay. The appellate, however, found that the exclusion of the report was reversible error since the report was not offered to prove the truth of the matter asserted, but to prove the fact that the county had knowledge (notice) of the terminated employee’s alleged wrongdoings prior to terminating the employee. See Spatz v. Kirby, 705 So.2d 657 (Fla. 2d DCA 1998). Finally, in a criminal action involving grand theft of a van, the defendant was arrested with a passenger in the van. The defendant’s defense was that he had the good faith belief that the van was owned by the passenger. At trial, the defendant called a witness. The witness testified that the day before the arrest, the defendant was driven to his house by the passenger. The trial court, however, excluded the witness from testifying that the passenger told the witness in front of the defendant that the passenger owned the van. The appellate court held that this testimony was not hearsay because it was offered to prove the defendant’s state of mind–that the defendant had a good faith belief that the passenger actually owned the van. See Alfaro v. State, 837 So.2d 429 (Fla. 4th DCA 2002).